Texas court halts Nicaragua’s Bernardo Tercero execution. 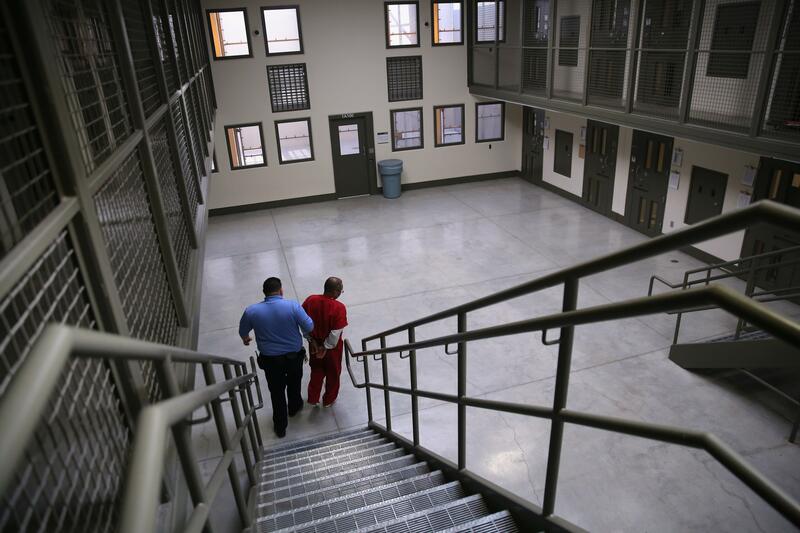 A guard escorts an immigrant detainee at the Adelanto Detention Facility in Nov. 2013. A Texas criminal appeals court on Tuesday stayed the execution of a Nicaraguan man convicted of murder after defense lawyers claimed a witness falsely testified against their client denying him due process during his 2000 trial. Bernardo Tercero was scheduled to be put to death by lethal injection on Wednesday; the court’s order said it stopped the execution to allow the court to review the disputed testimony. Defense lawyers had another appeal before a federal judge in Houston, contending Tercero was mentally incompetent for execution. That appeal had not been ruled on when the state court halted the punishment. The case has attracted attention in Tercero’s home country, where a clemency plea from Nicaraguan president Daniel Ortega was forwarded to Texas governor Greg Abbott… Tercero contended the shooting was accidental. He testified that Berger confronted him and tried to thwart the robbery, and the gun went off as they struggled. “I believe it could have been me or him,” Tercero said. He was arrested in Hidalgo County near the Mexican border more than two years after the slaying. “Tercero’s lawyers have argued he had deficient counsel at trial and sentencing and at every stage of his post-conviction proceedings,” according to Reuters.